JoAnn and I had the dogs in tow as we battled through the horrible rush hour traffic that is the Greater Puget Sound Region. From Redmond to Olympia on a Friday evening is a prescription for misery. Rolling slowdowns, 10-20mph crawls test the most patient. Three hours later we broke out on the far side of Tacoma, heading south on I-5, then turning and heading due west to Aberdeen and finally south to Raymond toward our destination, Long Beach. These days I’ve come to accept that it’s a struggle to go anywhere at rush hour on a Friday. But the destination and the weekend forecast was well worth it. A sunny weekend with calm winds and the promise of empty beaches to walk the dogs were calling us. To top it all off I was excited to be able to get to partake in one of my favorite types of fishing, Washington Red tail surf perch fishing. If you have never fished the surf for red tail in Washington then I am here to say that you are missing something very special. Standing knee high in the surf, watching and hearing the breakers come in to shore has to be one of the most relaxing and awe-inspiring types of fishing I know. It’s a unique type of fishing that requires little in the way of complex gear or technique. It’s an opportunity to feel the force of nature all around you, taking it all in, and as a bonus providing the opportunity for catching a tasty white-fleshed delicacy of the sea. I’m referring to red tail perch. And if you are thinking “what is this guy smoking”? I’m here to say nothing more than nature’s finest display of power and glory. We arrived late, 10pm, and unloaded our belongings. 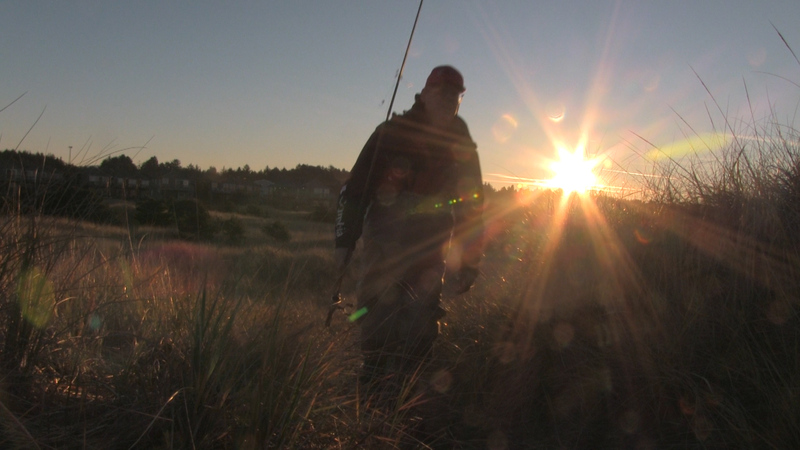 My plan was to get up in the morning at day break and fish for a couple hours letting JoAnn and the dogs sleep in. That plan was thwarted however by Diesel, our eager puggle. 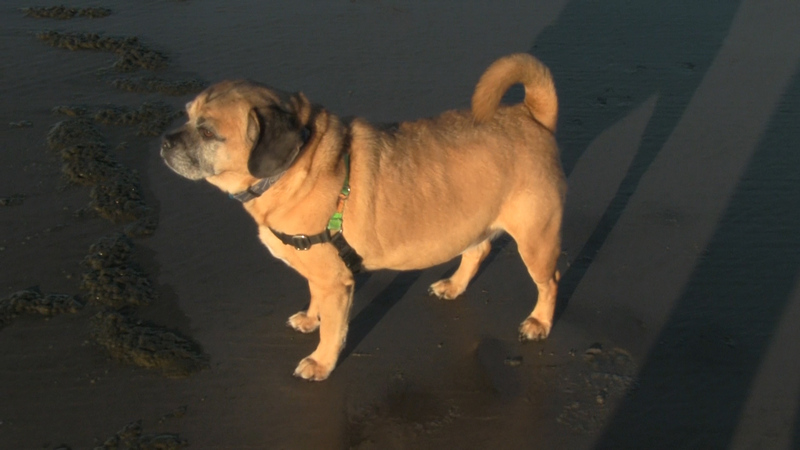 He awoke and seeing me get ready made it clear that he, too, wanted to enjoy the morning beach. So with Diesel in tow I walked the quarter mile to the beach and prepared to give the surf perch a go. Fishing for red tail perch is a fairly straight forward affair. My personal rig consisted of a 9 ½ foot spinning rod with an inexpensive sinning reel, loaded with 12 pound mono. The rod was actually a ten foot rod missing six inches – don’t throw out those broken rods as they work just fine for perch fishing. No need to trapes out there with a $200 rod for these fishing. The working end of things consisted of a “crappie rig” which had two 90 degree wire harnesses, each of which had about 5-6 inches of mono to a #6 worm hook. On the end of the harness I settled on a 3 ounce disc sinker. 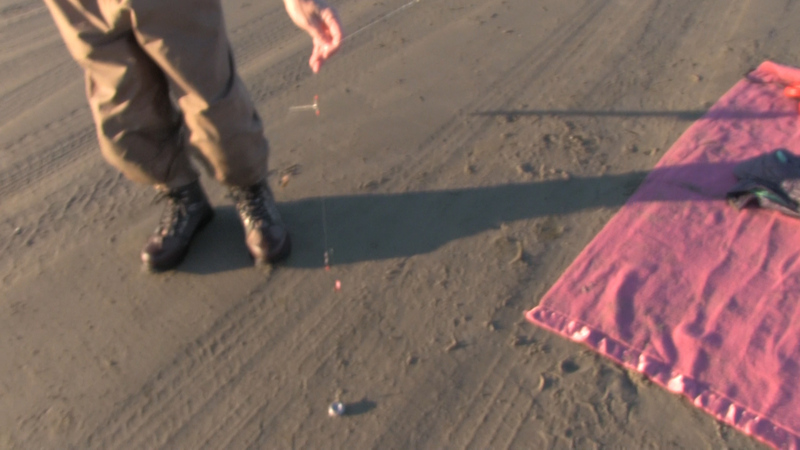 The sinker weight is determined by the amount of weight you need to cast out into the surf, and how much weight is needed to maintain contact with the bottom without your gear washing into shore too quickly. Generally you’ll be looking at 1-5 ounces. For heavy weights of course you will probably need a sturdier rod. For today the rod combo I had was perfect for the conditions. By the way, there are other shaped weights surf perch anglers will use. Many are partial to the pyramid weights. I’ve tried these and found that they dig into the sand too much. I prefer my weight to be able to shift and move a bit with the in and out pounding of the surf. Attached to the two hooks for bait I used a piece of clam (from a can of clam pieces) and on the second hook a Berkely saltwater pile worm imitation. This particular plastic has proven to be pretty darn effective for perch, with the added benefit of being a tough bait that stays on the hook well. Perch have small mouths, so don’t use a big chunk of bait. I would break the gulp product in half so it was around an inch long. 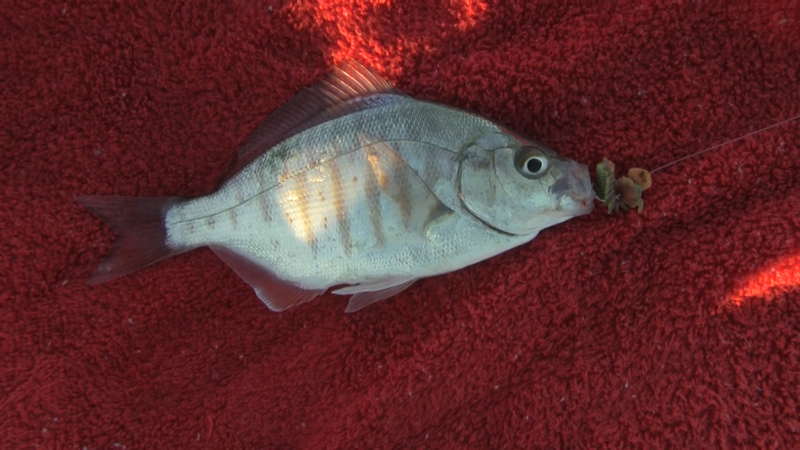 Perch tend to peck at the bait rather than engulf it. Another trick you can use is to add a small tuff of yarn to the hook. This does a few things to increase catch ratios. First, the yarn color acts as a visual attractant in the swirling surf. Second, the yarn will hold bait scent. Third, the yarn may have a tendency to catch in the fish’s mouth giving you that extra second to hook up. I worked my way out into the surf, and looking back at Diesel observed he had found a spot by my gear pail to sit and watch the world go by. That dog sure has a good life! When fishing the surf there are a few things to be aware of that are essential for your safety. First and foremost, never turn your back to the waves. A rouge wave is a wave are those waves which are greater than twice the size of surrounding waves, are very unpredictable, and often come unexpectedly from directions other than prevailing wind and waves. If one catches you off guard it can easily knock you off your feet and into the water. Since you’ll have waders on the risk of getting pulled under goes up immensely. So when fishing stand facing the surf, with your legs slightly spread for a stable platform. Periodically you’ll need to move a few feet as you’ll notice your feet sinking into the sand. I never go out farther than knee high into the surf. There’s really no need. 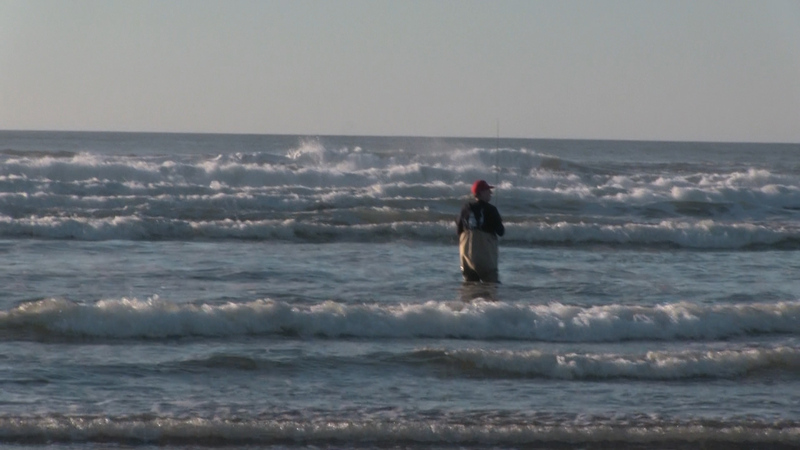 Surf perch can be found in 2-6 feet of water and you should be able to easily cast out far enough to cover this zone. Try to make your cast land just past a breaking wave and reel in your slack line until you feel contact with the bottom. Keep your rod tip up high. Periodically the surf will drag your gear closer to shore. Reel in your line and keep it taunt. This is actually a good thing because as your bait works its way back to shore it will be covering that 2-6 foot zone. When you start getting bites take note how much line has been retrieved. Surf perch tend to school so part of the challenge is finding them, not only traveling up and down the beach but also depth-wise. Another helpful tip is to explore the beach at low tide, making note of any depressions you might see. These depressions can be good spots to cast into as the tide rolls in. Fishing the incoming tide is generally considered more productive, so having a game plan helps, as does the flexibility to move around looking for schools of fish. Having a small net bag attached by line to your waders will allow you to keep fishing without walking out of the surf every time you catch a fish. The “tap tap tap” of a red tail perch got my attention and I pulled back and set the hook. Red Tails average 1 to 3 pounds. 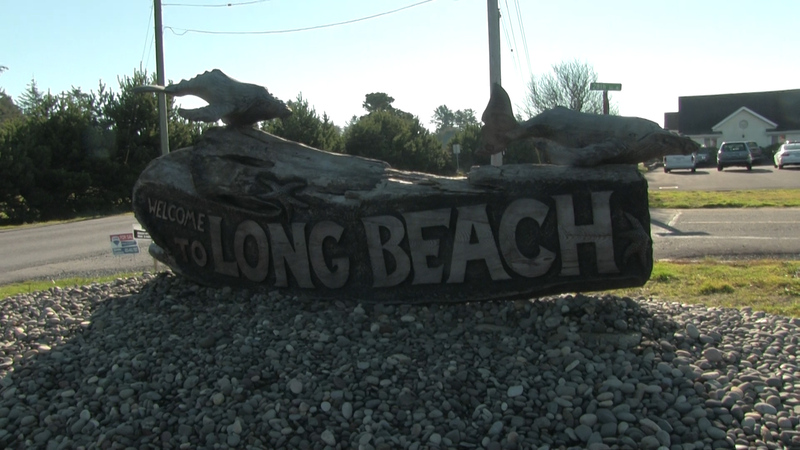 The state record, 4.05 pounds, was caught by Chris Maynard at Kalaloch in 1996. Like other panfish they tend to run in uniform sizes so if you find a small fish you’ll likely catch more of the same. In my case the fish was a small guy, around 6-7”. I unhooked the fish and got back to fishing for more. Fishing for red tail perch is a peaceful, relaxing way to get out and enjoy the sounds, sights, and smells of our Washington coastline, with the bonus of going away with some tasty white-fleshed fillets. Give it a try sometime! Great report Mike. Did you find any large enough for a meal?